There are 10 reviews of Navy for Men. Sure, this one is a tried and true drugstore scent (the kind usually not behind locked glass doors). But Navy is like a discount Ralph Lauren Polo Sport or Aramis New West (mentioned by other reviewers), containing a sporty fougere quality that, for its price, isn't bad. Navy is tart, minty, watery with a medium dose of spice from sage and nutmeg that work nicely to brighten this scent up. Navy ends with a credible, warm drydown with leather, wood and Canadian fir balsam. Overall, Navy is a safe, non-cloying fragrance meant for casual every day wear. It's not a pretentious cologne meant to conquer it's budget-minded peers, but a basic, elementary scent that men can wear in moderation. Minty, spicy, aquatic similar in opening to Polo Sport. Drydown is a bit cheap and sour smelling, but overall not nearly as bad as reviews here would lead you to believe. I've had this before, and grew up wearing it. This was one of the things I received in a gift size when I was a teen before I struck out on my own and bought fragrance. This predates my first exploration with Avon (then later designer fragrances) I would say it is in the same train of thought as Cool Water, Polo Sport, and Wings. My belief is that most fragrance tropes when new, are typically heralded by 3 or 4 scents that first create a precedent, then carry the ideas of that precedent along to it's ultimate conclusion. Everything coming after these innovators is a redundant retread to cash in on the popularity of the vibe established by it's progenitors until a new twist in the formula is found, with this being one of those such cash-ins. Cover Girl was a Kmart/Walmart-level makeup company that to this day fills our heads with "easy breezy beautiful" jingoistic nonsense, but when they tried to break into fragrance in the 90's, it didn't pan out for them and they divested themselves of it to Dana, who were quick to snap up anything with legacy value that they could peddle downmarket. Luckily, Cover Girl fragrances were already downmarket so nothing had to really be changed here once the scents switched hands. I can totally understand why this exists: Cool Water invented the idea of the blue-obsessed aquatic fresh fougere, discarding all the powdery and aromatic fougeres of the earlier decades in favor of something much lighter, crisper, and impossible-to-produce without modern chemistry. Polo Sport took it to darker places and Wings literally sent the concept into orbit with more laundry-soap-blueness than a smurf could muster. Good old Armani would finally rid us of the literal "blue" note in aquatics when Acqua di Gio would land the same year as this, but that was the start of another trope, the aforementioned twist that changes the rules of the game. I won't say that some decent aquatics didn't also surface around this time or after, but were they different enough to escape direct comparison to these three? Probably not. Nautica escapes this fate just because it was so radically different yet reached the same conclusion as the rest of this pack, so it gets a pass. What I smell in this is somebody's attempt to make a cheaper and lighter Polo Sport, with a tiny bit of urinous funk somewhere that sours this enough to make it stand a tad apart from further similarities. It has the usual berries, citrus, light woods, herbs, and a cold menthol/mint note just as all the rest of it's ilk, but they're mixed in slightly different ratios, and the overall strength on this fragrance is abysmal, even for an aquatic. Navy for Men seems to also have an unlisted calone note, which draws comparisons to Aramis New West (1989), but just in that note inclusion alone. It's best for a super humid or hot and arid day. It mixes well with heat, sweat, or moisture in the air as expected. I wouldn't wear this to formal gatherings, court dates, etc. since it's too ubiquitous a trope to convey any seriousness in those environments, but it's perfect for a casual summer evening at a local bar, a sweaty work day, or even a day about town in a hot city if other better aquatics are not at hand. Sure, it's cheap and it doesn't contain any unique notes or the kind of depth one would expect from an expensive master-blended perfume, but it does the job for the price and is certainly a better alternative to the Axe/Lynx/Tag body sprays you might otherwise get for the price. I had it, used it up when there was nothing better and I had no concept of fragrance, then bought a larger bottle of it about a decade later to remind myself of it, since my teen memories of it imparted a fondness brought about by nostalgia. I didn't detect any change, but realized just how unoriginal it was when I smelled it again, with much more knowledge of fragrance under my belt by that point. I don't hate the stuff, I can't. It's perfectly adequate when adequate is all you're willing to pay for. It smells not a thing like the Navy perfume Cover Girl launched years before it, and is the only male scent they ever made before selling off to Dana. It's not a direct knock-off of any one scent even if it riffs close to the aforementioned Polo Sport and New West, but I don't see myself ever owning this again. In fact, I had to give my bottle away when I tired of that weird sour drydown it has. You literally don't -want- to make this an all-day fragrance, it just doesn't have the balance or poise for it. In a pinch, grab this, otherwise, just a few more dollars nets you a bottle of something from the second wave of aquatics in the 2000's, which although also arguably retreads, have much more diversity and character in their "blueness" than this does. I haven't even seen this in stores for a long time now, so it's probably relegated to the overstock sites as Dana themselves don't even list it on their own webpage anymore. It was an also-ran that ran it's course, then got a second lease on life it didn't deserve, only to finally be given it's proper burial. You can get it for under $10 if you really want it: that speaks volumes. Just awful. I understand tastes are subjective, but I don't know how Navy for Men got green-lit. There's something wrong with this product. Don't they have focus groups? Cat vomit on wet cardboard. 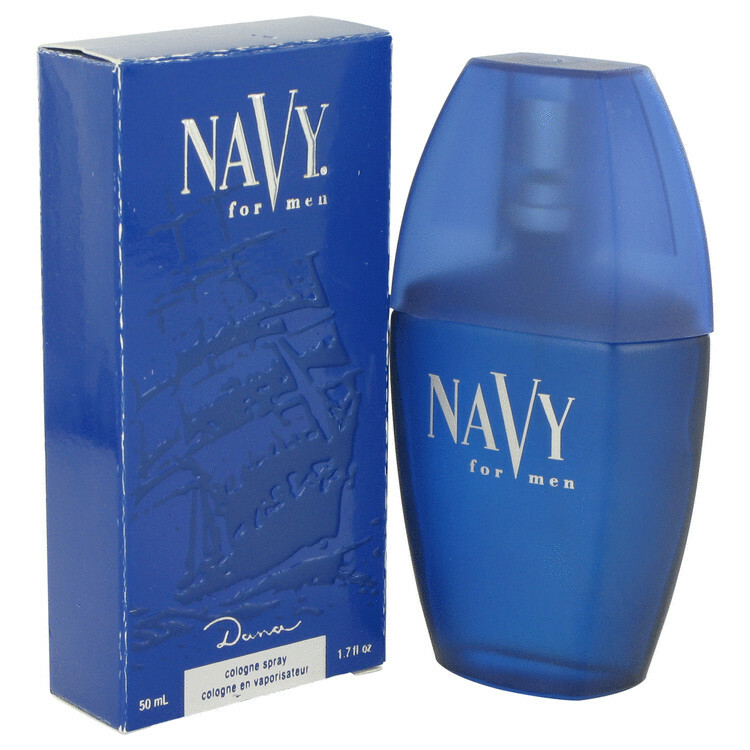 Navy for men makes me smell like a woman--a woman wearing cheap cologne that is. I just threw my bottle out. For shame. I award Navy no points and may God have mercy on its soul. I haven't liked any of Dana's products thus far. A recurring theme in sci-fi films is the scenario in which a team of scientists is performing a series of experiments and taking extensive notes on a dangerous subject in a room/tube/tank when, invariably, the subject breaks free and escapes and one of the scientists gets on the horn and declares, 'We have a problem." Navy is the beast that escaped, destroying my lab and my colleagues, and spraying its glandular rotting compost hormones all over the scene of the crime. As sometimes occurs in film I had to call a priest in to perform an exorcism, banishing this creature back to Hell. There are no member images of Navy for Men yet. Why not be the first?